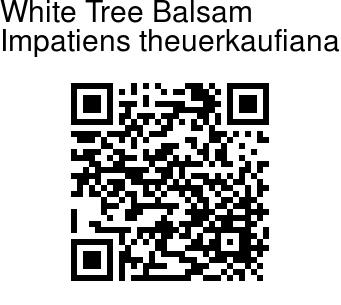 White Tree Balsam is a newly discovered balsam, usually seen growing on the moss-covered trunks of evergreen trees in the forests of Kerala. 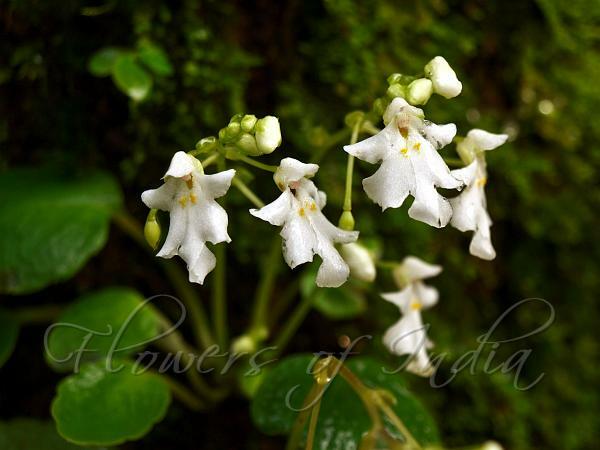 The species name is in honor of Mr. Wolfgang D. Theuerkauf, founder of the Gurukula Botanical Sanctuary, Alattil, North Wayanad, Kerala and an ardent naturalist and botanist who devoted his life for conservation of wild plants of Western Ghats. The plant is an epiphytic perennial herb, 10-20 cm tall, rootstock tuberous, tubers whitish, spherical. Leaves are 1 or 2, arising from root, stalked, pendulous, membranous. Leaf-stalks are 5-8 cm long, pale pink, slender, hairless. Leaf blade is 10-16 cm long, 1.5-3.0 cm wide, elliptic-lanceshaped or lanceshaped, tip pointed, base oblique, narrowed, faintly toothed along margins. Leaves are pale green above, pale pink, glabrous below. Nerves are 4-6 pairs, prominent and pale pink below. Flowers are borne in a simple raceme carried on a leafless stem, semi-pendulous, slender, 12-20 cm long, hairless, 5-8-flowered. Flowers are 1.3-1.5 x 1.0-1.3 cm, white with yellow patches of papillae near the centre. Flower-stalks are 2.0-3.5 cm long, elongating in fruiting stage. Bract are broadly ovate, about 8 x 4 mm, concave, pale green, glabrous. Sepals are white, hairless, lateral sepals about 2.0 x 1.2 mm, broadly ovate, entire, lower sepal broadly elliptic, ending in a spur which is straight, pouch-like, 3.5-5.0 mm long. Dorsal petal is transversely elliptic, 3.5-4.0 x 5.0-6.0 mm, basally and distally bilobed, margins wavy, hairless. Lateral united petals are 3-lobed, not eared,	1.0-1.2 cm long, white with a tuft of yellow papillae a little above the base of the inner margin. Basal lobes are largest, about 4 mm long, bent upwards, broadly obovate. Middle lobe is smaller, about 2 mm long; distal lobe narrow, straight with sub-truncate tip, 3-4 mm long; stamens 5, fused. Ovary is pale yellow, broadly ellipsoid, pointed at apex, glabrous. Capsule is broadly ellipsoid, pointed, about 8 mm long, hairless. Seeds are up to 70, minute, tuberculate, with a dense tuft of hairs at both ends. Flowering: July-August.